Tonight’s the night. Tonight’s the night that our city is transformed by more than 110 contemporary art projects created by hundreds of artists. 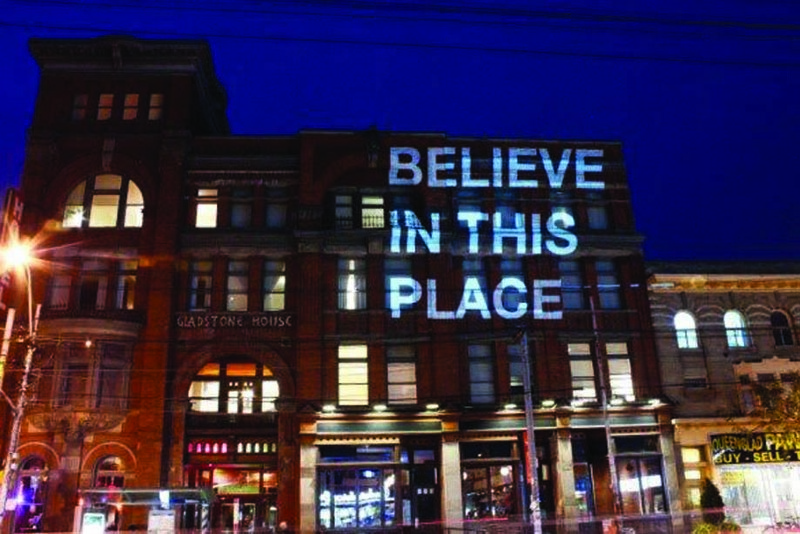 There will be installations and immersive experiences throughout the downtown core, with a special project hosted in our stomping grounds at the Gladstone Hotel. Fly By Night is the Gladstone Hotel’s long-standing Nuit Blanche art exhibition, which has returned to showcase 9 projects that create completely unique experiential environments. The art will be displayed in the hotel’s studios and the public space on the second floor gallery from 7 p.m. – 4 a.m. on Oct. 1, 2016. Fly By Night offers a unique environment of contemplation and activation, encouraging guests to explore through the different space in Toronto’s oldest operating hotel. One of the featured projects is Garnet Willis’ installation ‘Gaia’s Banjo’, a gigantic conceptual Banjo instrument-turned-installation that plays through distribution of weight as guests alight the structure, triggering acoustically produced sound masses at a distance. Another notable piece is Valerie Carew’s ‘Dreamscape Blanket‘ which is a sculptural and performance piece about the mergence between interior domestic environment and the outer natural world in the form of a living moving plant blanket! Typical of Gladstone artistic events, Guests can anticipate a deluge of multiple happenings including Music, Art, Food, Drink, Dance and Karaoke all under one roof. Guests are encouraged to grab a libation and explore the various floors as they ‘Fly by Night’ through Toronto’s Nuit Blanche.